Check our interview with talented Australian actress Cleo Massey. Hi Cleo, please tell us a little about you? Well I was born in a small little island state in Australia called Tasmania! When I was 4, my parents moved me up to the Gold Coast which is a beautiful beach city. I’ve lived here ever since and absolutely love it! I’m a lover of watching and acting in comedy’s, I enjoy writing whether it’s for film & TV or my blog, Pass Around the Smile. My blog is all about positivity, the Law of Attraction, self love and meditation, it feels so good to help people. I have also started my own motivational speaking events with Pass Around the Smile! I also spend quite a bit of time living in LA, doing lots of auditions and meetings, I have my acting visa for the States. My dog Ted is my best friend and I’m obsessed with Beyonce. Swim in the ocean or pool first, whatever work is on that day, whether it’s an acting job, social media work, blogging or planning an event. After work I’ll try to get to a pilates class or go for a walk on the beach with my dog, then dinner with my family and boyfriend! Luckily I have a few. My Mum, Dad and partner Luke. I always did performing arts classes growing up and loved it, but it wasn’t until I auditioned for a show called ‘H20 Just Add Water’ that I got a proper taste in the Film & TV industry. Kim Sertori in H20! It was such an incredible time for me. I filmed that show for four years over the time I was in high school. It was so much fun and such an amazing start to my career. Yes, I grew up doing acting classes and continued doing acting workshops and courses throughout the time I was working. I think it’s important to always be practicing your craft! Best part is getting to play make believe and throwing yourself into all of these different characters! Worst part is probably the competitiveness of the industry! So many people go for one role. I make sure that when I have down time I use it to relax and not fill it with social occasions or more work! Sometimes the most productive thing you can do is rest! I just read over and over the script. I think itbs really important to understand a script back to front before stepping on set. I also make sure I understand every characters motivation, not just mine. It helps so much with a performance when you understand how other characters are feeling or what theybre doing, because in real life, itbs natural to know this information about the people around you! Now tell us about your work in the new horror-comedy series “CURSED? I play ‘Emma,’ she can be a little feisty, and often puts herself above others, however she has a soft side where she admires people who are kind and confident within themselves – something she wants to be but never has been! It’s been such a fun series to be involved in, the production crew were amazing and majority of the cast were comedians, which made it an hilarious set to be on! Cursed is about a boy who drunkenly plays with a Ouija board. Consequently, he ends up being Cursed by a ghost. The best bit is the ghost, Perry is totally clueless and has no idea how to haunt people. Back in the day I was in a few different series such as Monarch Cove and Mortified. I also was in a feature film called The Little Things. Most recently, I was in a comedy series called ‘Stage Mums’ which was actually created by my real Mum! We got picked up by Network Ten in Australia which is owned by CBS and we are in development for Season 2 now! Hmmm, I actually like to play everything. I love a ditz, but then I love a smart, empowered woman! I definitely prefer comedy, but do love every genre. 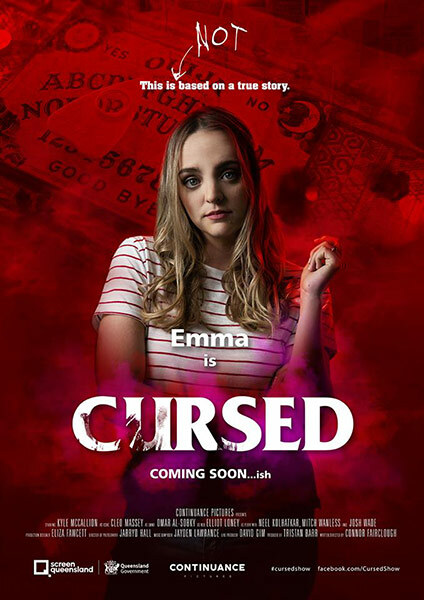 The most challenging role would probably be Emma in Cursed! She was the only character in the series who wasn’t extremely loveable. I had to make sure she was still likeable from an audience’s point of view, even though she is a bit rude and straight forward. That’s quite hard to do! My favourite role would definitely be Kim in H20. I was such a brat, and I think when you’re younger, you just get away with it a bit more! What is next for Cleo Massey in 2019? I landed a role in a series filming this year called Interface and hopefully Stage Mums Season 2 will go into production! I’ll also be continuing my own Pass Around the Smile events and hopefully will move into production on my own film and tv series I have written. I also will probably make a trip or two back to LA. Ohhh, I have a lot but I’m going to go with Amy Poehler. She is just hilarious and so effortlessly takes on such interesting characters. My phone (how embarrassing), a snack and a hair tie. BEYONCE! Because I am totally obsessed, she is a Queen. You can call me, Cleyonce …. I’ve seen her live seven times and cried my eyes out every time! Flowy. You’ll rarely see me in anything tight. I swear I also loved the boho type fashion before it became what everyone was wearing, hehe. Anything Beyonce …. and I also love anything feel good! RNB is always great for a boogie. Pool swim, yummy brekky, surf in the ocean with my boyfriend, lunch with my friends on a hill by the beach, some inspirational reading for the arvo and a dinner with my fam! Sometimes trash TV is great because I can just let my mind be still. But otherwise Parks and Recreation, The Office, good little comedy shows like those! Hmmm mango, I also love veggies! Hopefully acting in all sorts of incredible productions, some of those being my own. Traveling the world with my Pass Around the Smile events and coming home often to spend time with the ones I love the most! I support different charities here and there. My friend group decided last year that every birthday, instead of presents we would transfer money to the birthday girls chosen charity. You can follow me on Instagram on @cleomassey and @passaroundthesmile. You can also read my blog on passaroundthesmile.com and Cleo Massey on Youtube! Celebrity Crush: Hemsworth brothers, hehe. Song: So hard! Formation, Beyonce.